So, the already magic meat and cheese curing fridge got a bit more magical. I see your meat and cheese. And I raise you beer! The meat at the moment is a bit meager - just a few kielbasa hanging for a bit to tighten up, and the cheese is currently hidden away in side drawers. The beer, on the other hand, is going full steam. We have two batches on tap in the magic fridge - a Belgian Tripel IPA (which I am sure will get its own post in future) and a kegged version of our Piggish IPA. Freedom from bottling is a wonderful thing! All hail the magic fridge! I found your blog through Alice Q Foodie and it's now a favorite. Thanks for the "hard" work and keep it up! Thanks, Sawyer. We'll post details and the recipe for the Tripel IPA soon. Andrew - welcome! Glad you are enjoying the blog. My wife got me a beer fridge long ago. After 5 minutes, had a hole drilled in the side to accomodate a line from my 20 lb CO2 tank (it was only big enough for two 5 gals). Kegs and a dedicated fridge is decadent. I like the idea of keeping the CO2 outside and running lines in. Our tank is taking up valuable space. We will definitely consider doing that when we motivate to mount external taps (we're just using picnic taps inside at the moment). Mike, drilling the side is easy and not too destructive. Can use nice white grmmets too to pretty up the hole. I use 1/4" id for a pressure line and it's fine. This way, with the tank outside, I can use the second regulated outlet to pressure up a keg about to go in to about 50 psi and let it sit to absorb the gas. Gives a small head start to the settling of the new brew. Good luck. a fridge dedicated to meat, cheese, and beer. All hail the magic fridge. I hope Ms. Goofy will let me install a keg too. 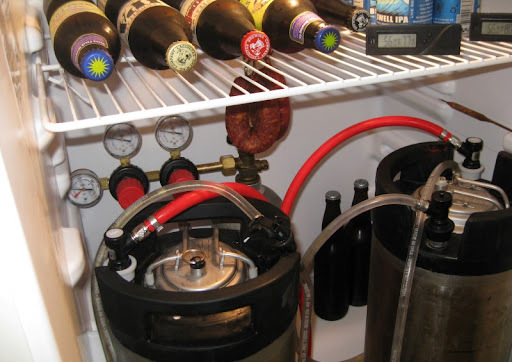 Not only did Sherry let me have kegs in the fridge, she even installed them for me!